The next morning, the twins hear two gondoliers arguing, one of them accusing the other of stealing his most beautiful boat. The gondolier begs Ethan and Ella to help him find the boat. They agree, and also tell the man they need to get to Calle Farnese. 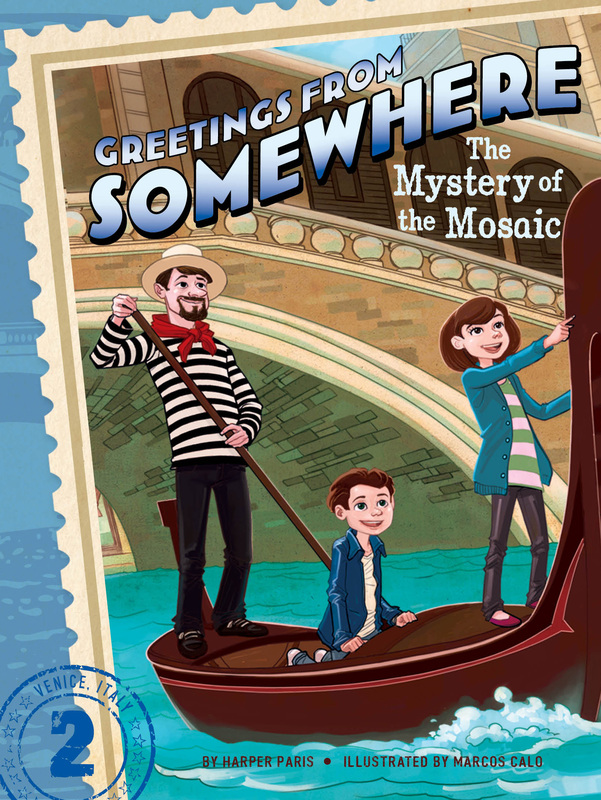 Will the twins be able to find the stolen gondola and their Grandpa’s favorite mosaic...before dinner? Ella Briar and her twin brother, Ethan, had never been to Venice, Italy, before. They’d never been to a floating city, either! Venice was made up of a bunch of tiny islands connected by canals and bridges. The canals were like streets, except filled with water. So some people were using boats to get around, and others were walking over the bridges from one little street to another! The Briar family had traveled by water taxi from the airport. The sleek motorboat pulled up to a cream-colored building with lots of balconies. “Here’s our hotel!” the twins’ mother, Josephine Briar, said brightly. “Is it older than you guys?” Ella asked with a sneaky smile. The four of them stepped out of the boat with their suitcases. Pink, yellow, and pale green buildings lined both sides of the canal. Pretty flowers and vines filled the window boxes. There were no cars or bicycles on the cobblestone streets, only people walking.